The mountain goat (Oreamnos americanus) is the single North American representative of a widespread group of goat-like ungulates. The mountain goat (Oreamnos americanus) is the single North American representative of a widespread group of goat-like ungulates. All are characterized by relatively short horns and a fondness for living in rugged terrain. Occupying the remote habitat that it does, little was known about the mountain goat until almost 1900. Mountain goat hides had been obtained by Captain Cook as early as the late 1700s, but he had presumed that the specimens were of white bears, and the species was not described. The mountain goat’s range is restricted to the steep and broken mountain ranges of northwestern North America and extends naturally from Idaho and Washington to Southcentral Alaska. Mountain goat populations are scattered throughout this range and can be found from near sea level to over 10,000 feet, but some seemingly suitable areas are completely devoid of goats. In Alaska, mountain goats occur throughout the southeastern Panhandle and continue north and west along the coastal mountains to Cook Inlet. In Southcentral Alaska they are generally confined to the Chugach and Wrangell mountains, although their range extends into the Talkeetna Mountains nearly to Denali National Park. Mountain goats also have been transplanted to Kodiak and Baranof islands where they have established secure populations, to Chichagof Island where the transplant apparently failed, and most recently to Revillagigedo Island where they are doing well. 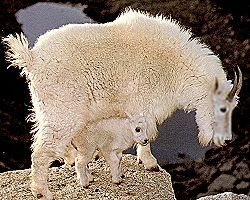 Mountain goats are one of the two species of all-white, hoofed, large mammals found in Alaska. They are often confused with young and female Dall sheep, but are easily distinguished by their longer hair, deeper chest, and black horns. There is a crest of long, erect hair up to six or more inches in length along the spine, on the rump, and over the shoulders and neck. Long hairs on the legs give the animal the appearance of wearing pantaloons. A shaggy crop of hair hangs down from the chin and lower jaw. The pelage is much longer in winter than in summer. Both sexes have a crescent-shaped gland behind each horn that increases in size during the rutting season. The appearance of both sexes is much alike except that males are considerably larger than females. The horns of an average adult female are equal in length to those of an average adult male but are more slender. Sexes are extremely difficult to differentiate in the field unless the female is accompanied by a kid. Goats are usually quite docile and their usual gait, even when alarmed, is a deliberate pace. Throughout their lives mountain goats remain in or near steep, broken terrain, a behavior pattern which most likely evolved as a means of avoidance of predators such as wolves, bears, or cougars. Mountain goats mate in November and December. Billies (male goats) may wander considerable distances in search of receptive females (nannies). They do not collect harems, but some battling occurs as males often show puncture wounds, particularly on the rear quarters. Adult males are segregated from other age classes except during the rut. They may form small bachelor groups, especially in summer. Females with kids and immature animals are generally found in groups but may form larger nursery bands in early to mid-summer. Usually a single kid is born in late May or early June after a gestation period of approximately 180 days. Twinning occurs rarely but is more frequent following mild winters. Kids are precocious and can keep up with adults when only hours old and hardly larger than snowshoe hares. Nannies seek solitude prior to giving birth but soon join other nannies with newborn kids to form nursery flocks. Kids usually remain with their mothers until the next breeding season. Mountain goats may live 14 to 15 years, though most live fewer than 12. Many goats show healed wounds and missing teeth, indicating a high incidence of accidents, presumably from falls. Mountain goats are both grazing and browsing animals, depending on the particular habitat and season of the year. They normally summer in high alpine meadows where they graze on grasses, herbs, and low-growing shrubs. Most goats migrate from alpine summer ranges to winter at or below tree line, but some may remain on windswept ridges. As winter advances and the more succulent plant species are frost-killed, the feeding habits shift to browsing. Hemlock is an important winter diet item, but feeding habits in winter are mainly a matter of availability. Mountain goats are not particularly wary of hunters and rely on the security of their cliffy territory. Approaching within shooting range is not difficult if the hunter is able to negotiate the terrain. When possible, it is usually best to approach from above as goats are more alert to possible danger from below. Goat horns are not particularly impressive when compared to some of the other game species, but from the standpoint of physical hardship, spectacular setting, trophy judging, and difficulty of the terrain, the trophy billy goat presents a unique challenge. The pelt of a prime mountain goat killed in late fall or winter is a beautiful specimen. Interest in goat hunting has increased in recent years. Goats are relatively abundant throughout their Alaskan ranges, particularly in southeastern Alaska, but many goats live in areas that are beyond the reach of hunters. With increasing demand, hunting must be regulated by permit systems statewide to avoid localized overharvest in accessible areas. Mountain goats can provide excellent meat for the table. As with other wild food animals, much depends on when and how the animal is killed. A nanny or billy of three years or less taken prior to the rigors of winter is outstanding meat. Adult billies, regardless of the season they are taken, are generally very tough—particularly so after the rut. An excellent way to use the meat of an adult goat is to grind it into hamburger or have it prepared as sausage or other similar meat products.